I couldn’t wait for a day off to try it so I installed it yesterday evening. I have never before installed a cartridge, and I must admit the thought of doing so was a bit daunting. 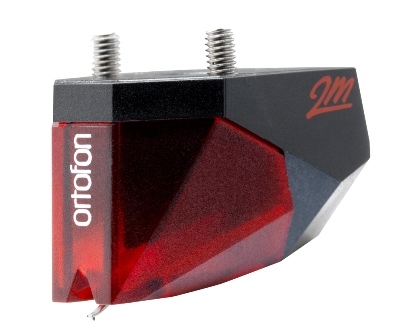 I had read a lot about installing and adjusting phono cartridges in the past few weeks so I understood the basics. 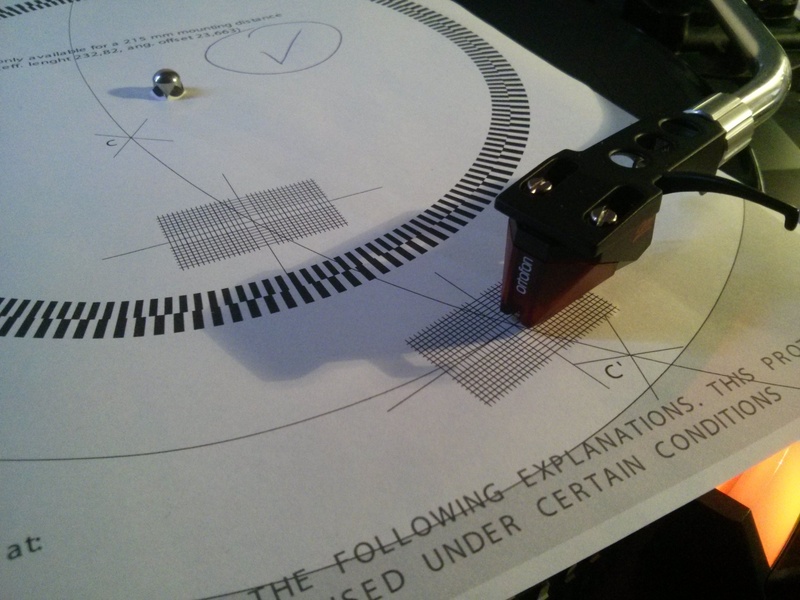 I had downloaded the Technics protractor from vinylengine.com, printed it and checked the scale of the print. But now it was time to put the theory into practice. I soon realized that this new cartridge wouldn’t fit in the headshell I had designated for it. This is an old style Technics head shell with one screw on the top. Although only one screw is visible in the picture, it has an additional mounting bracket underneath that should fit the 2 screws necessary to mount normal cartridges. 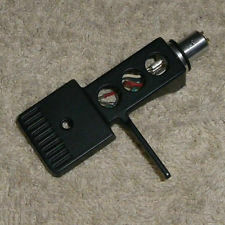 But my Ortofon needs to have the heads of the screws on the topside and that is not supported in this headshell. But fortunately I have two headshells, the other one is the newer type which has the normal two screwholes at the top. Using the screws which were provided in the package I was able to quickly attach the cartridge provisionally to the headshell. So that was fairly easy. Next was the task of adjusting the ‘contraption’ 😀 I took my protractor and put it on the turntable on top of a record. 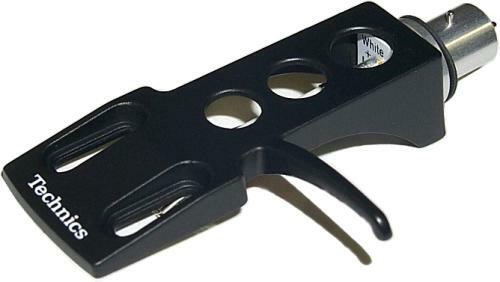 I soon learned that when I moved the cartridge all the way to the front of the shell that the needle followed the ‘arc’ on the protractor perfectly. Yes! But when I tested the alignment of the cartridge on the two gridline patterns on the protractor, I found that it was not perfect in line. So I adjusted it very slightly to the point that it was in line on both patterns and then secured the screws. Pfew! Job done! Then came the testing. I must admit I was a little but afraid, or better anxious. 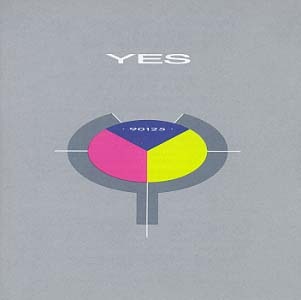 I tried it out with a record from Yes – 90125. I put the needle down very very carefully. I put on my headphones. But as soon as the first tones from the song (Owner Of A Lonely Heart) were played, I relaxed. It sounded very very good! There is a lot of definition in the sound. There is also a lot of ‘punch’, which I like. HF tones are also ok. Bass is tight and well defined. 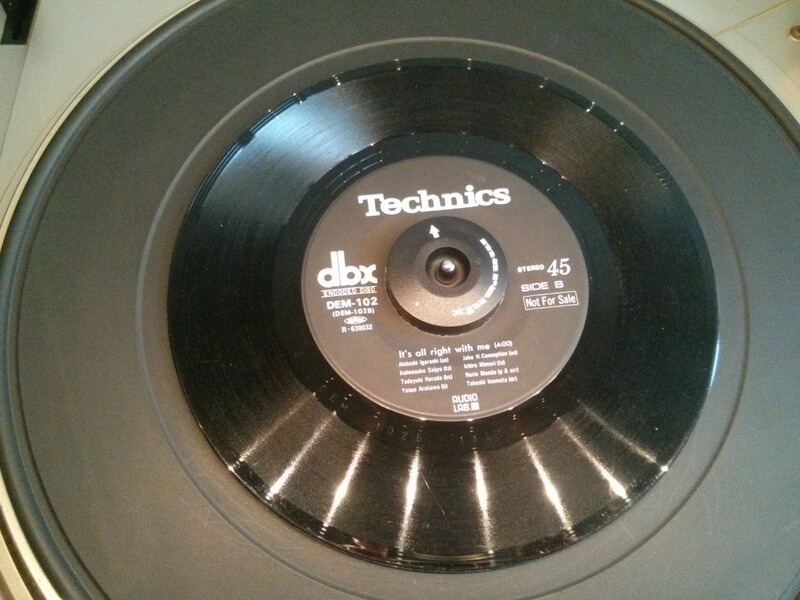 Overall, I have never ever heard a record sound so clear. True, in the past I have not had good quality turntables. In fact, they were rubbish. But I never thought a record could sound like this. It is so close to a CD. I’m also very glad that I treated my records carefully in the past, I didn’t play them a lot (I immediately recorded them onto tape) so that I now have old, but ‘like new’ records that sound wonderful! I continued to listen to albums from ELO, Marillion, Tchaikovsky and 12-inch’s from Chaka Khan, Unique (What I Got IS What You Need). Those were the first records I found for grabs. It was a good experience. I am pleased. In the coming evenings I will listen to some other albums. I was surprised how quickly and how easily an inexperienced person like myself could do this task. It took me a little over an hour including the adjustments. I can recommend it to everyone. This entry was posted in Audio on 19/12/2013 by Philip van der Matten. 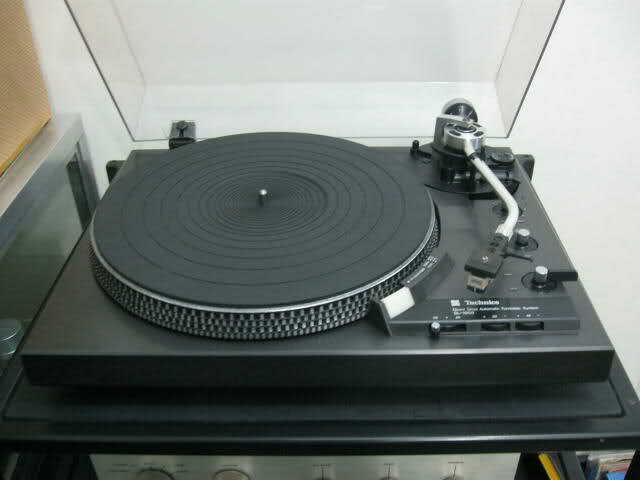 I was actually looking for a more high end model, like the Technics SL-1600Mk2, SL-1700Mk2, 1800Mk2 or even an SL-5300. But, those are hard to find, and when found, are very expensive and could cost more than €200,-. I found a very inexpensive SL-1900. 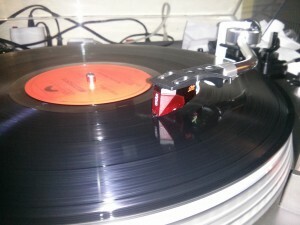 It still had the original Technics 270 cartridge installed. And it came with an additional 270 cartridge without a needle. So I thought ‘oh, what the heck’, and I went to get it. I was not disappointed. Not at all. In fact, I was very impressed. For the last years I have used a Dual cs-607, so that was my reference. And although the Dual has more definition, this one is more agreeable to listen to because….well, it has less definition. It doesn’t reveal all the noises and scratches and clicks and pops from the record so much as the Dual does. Compared to the Dual it lacks highs though. The Technics SL-1900 is a 2-speed, direct-drive turntable with fully automatic single disc playback. A one-chip IC, incorporating 321 elements, controls motor speed for superb accuracy with servo control. The tonearm mechanism gives convenient automatic set-down, lift-off and stop. Memo-repeat control permits up to six repeated plays of the record, or continuous play. The heavy monolithic bas and isolator system protects against external vibrations. The SL-1900 comes complete with an EPC-270C-II moving magnet phono cartridge. hochempfindlicher Tonarm mit Kardan-Aufhängung in Präzisionszapfenlagern. Damals ebenso aussergewöhnlich. Viscogedämpfte Tonarmsteuerung und Anti-skating – damals ein Novum ebenso wie die dicken, kapazitätsarmen Phonokabel. This entry was posted in Audio on 11/12/2013 by Philip van der Matten. The other day I received two dbx encoded 7″ singles, demonstration discs by Technics. These are supposed to have superior dynamic range and almost no noise/hiss/rumble whatsoever. 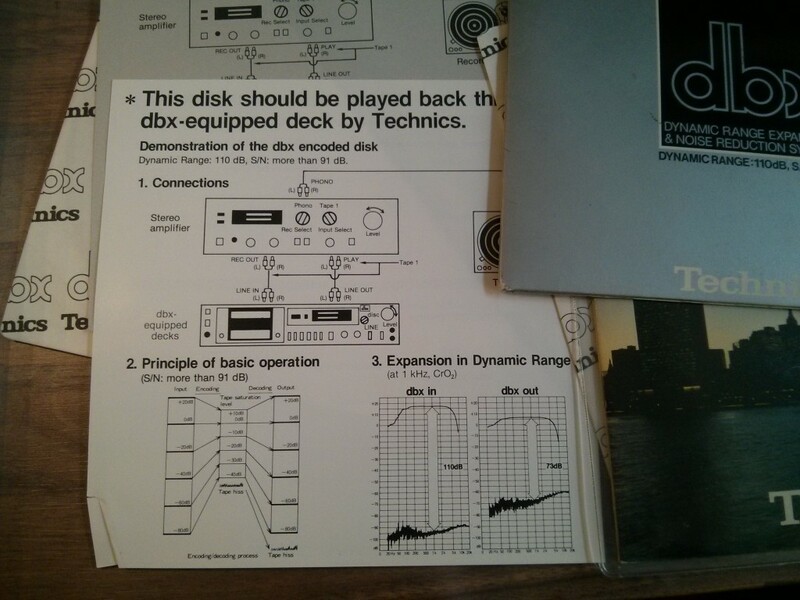 Well, the accompanying sheet suggest that you hook your equipment up to a dbx capable (cassette) deck, but I didn’t. Instead, I connected my dbx model 150 unit. Better! On all 4 sides was music, mostly jazz-like. On side A of the first disc was an impressive dynamic piece with flute and big drums. I was very surprised when the drums reached full power! And they go very loud! It is an extremely dynamic experience. Even on headphones. Clicks and pops and other vinyl noise are so unnoticeable, the whole listening experience is very, very enjoyable. Even the dropping of the needle was hardly audible. Now, I need to find me some other dbx encoded discs! edit: while writing this down, I’m thinking about what would happen if I record this on a tapedeck with dbx encoding. 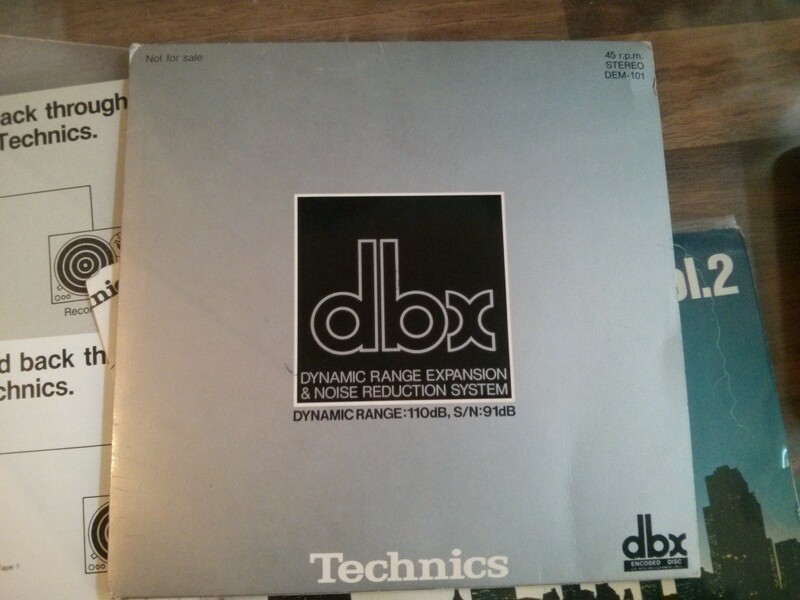 Or better: skip the decode and encode step, and record the disc as-it-is on tape, and the play it back through my dbx unit….interesting experiment. I should try that some time. This entry was posted in Audio on 04/12/2013 by Philip van der Matten.